ULTRA CORE INSULATED WINDOW SYSTEM We significantly increase Restorations U-value by filling the extrusions with Ultra Core Foam. The expanding polyurethane insulation foam fills critical spaces in the extrusions and greatly improves the overall thermal effectiveness. Restorations windows with Ultra Core polyurethane insulation are the most energy efficient choice—better than aluminum, wood, fiberglass or hollow vinyl. UltraCore R insulation in the window frame provides additional energy efficiency. 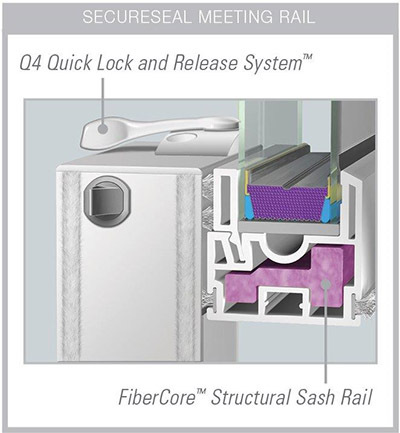 The meeting rail where two sashes meet is a critical area for air infiltration. There are not 1 or 2 but three separate triple fin weather strips between you and the outside air. In addition to keep the sash rigid for life so that air cannot penetrate there is FIBER CORE, a fiberglass insert that makes our window 9 times stronger than other vinyl windows. PASSIVE U GLASS XL EDGE glass features 7/8 overall thickness with an air space filled with high density argon gas. The XL EDGE glass has six layers of metallic coatings. This glass system has not only proven to be highly energy efficient but has been proven to last dramatically longer than competing glass systems.